Whether as a gift, a paperweight, or an anatomical model, this laseredcrystal model clearly depicts the eardrum in 3D. Weighs in at one pound and measures approx 130x50mm. Pocket-sized at only 12cm high, made from durable resin and showing great detail of the structure of the inner and outer ear. 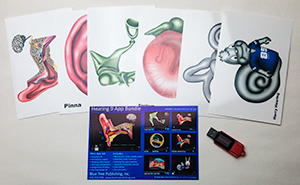 Valuable as an educational tool in schools and colleges of music and the performing arts, as well as for otolaryngologists, audiologists and speech pathologists in clinic. 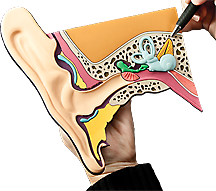 Made from durable rubber, this mat shows the hearing anatomy in raised relief. Ideal for client education in clinic. Approximate dimensions: 210x210mm. Great for audiologists, speech pathologists and ENT clinicians. 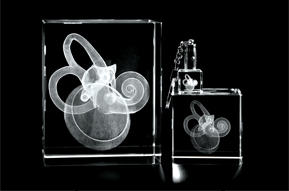 Whether as a gift, a paperweight, or an anatomical model, this lasered crystal model clearly depicts the cochlea in 3D. Weighs in at one pound and measures approx 130x50mm. Whether as a gift, a paperweight, or an anatomical model, this lasered crystal model clearly depicts the stapes in 3D. Weighs in at one pound and measures approx 130x50mm. 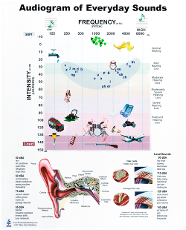 Ideal for client education or for waiting rooms, this poster outlines common disorders of the hearing mechanism with clear images presented on a plastic coated poster for durability and portability. Can also be used with a dry wipe marker. Size is approx 305x430mm. 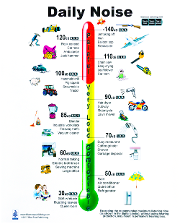 Ideal for client education or for waiting rooms, this poster outlines the everyday sounds and their frequency and intensity, presented on a plastic coated poster for durability and portability. Can also be used with a dry wipe marker. Size is approx 305x430mm. 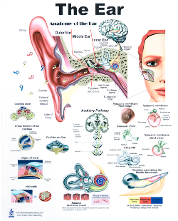 Ideal for client education or for waiting rooms, this poster outlines the anatomy of the hearing mechanism with clear images presented on a plastic coated poster for durability and portability. Can also be used with a dry wipe marker. Size is approx 305x430mm. 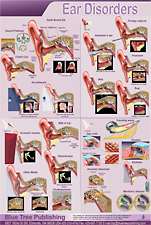 Ideal for education in industry, offices or waiting rooms, this poster portrays the dangers of noise pollution, presented on a plastic coated poster for durability and portability. Can also be used with a dry wipe marker. Size is approx 305x430mm.